Home / Insights / Christmas Card Marketing: To digitise or not to digitise? Christmas Card Marketing: To digitise or not to digitise? Tis the season for great marketing opportunities. Once again, the Christmas season has quickly crept upon us, like it always seems to. Without even realising it we’re now fully embracing the festivities, by putting up our office decorations whilst juggling a million baubles, as a load of our campaigns all come to a head at the same time. Most businesses start their end-of-year campaigns with the unspoken custom of business etiquette; the exchange of Christmas cards. This traditional Christmas greeting still holds a lot of value – it lets your clients know that you’re thinking of them and means you get the opportunity to remind them of your business and possibly even update them on anything new going on in your business (without overdoing it! ), with an added touch of festivity and fun. It’s an opportunity that your business shouldn’t overlook. However, the question that we continually get asked is: To digitise or not to digitise? We’ve received Christmas cards for as long as we can remember, and it’s a warming, nostalgic feeling when we get one posted through the door. In a world of increasing digitisation, it can be refreshing to see something familiar, simple, and traditional. Bringing things back to basics with handmade drawings, personalised messages, and red envelopes can put a smile on a client’s face, and that’s always a good thing, isn’t it? But while the sentiment is nice, it’s possibly not something that’s going to wow your customers and encourage them to pick up the phone. In fact, it could make them question your company’s innovative capabilities altogether if they receive a card that looks like it could be picked up from a supermarket shelf. ‘Going digital’ allows you to keep the card tradition alive, just with a modern twist. eCards, or equivalent digital innovations, still show your customer that you value them, but also demonstrate that you’re not afraid to move with the times. Not to mention the fact you’re actively trying to be environmentally responsible. Besides the overwhelming benefit of saving you both costs and time, digitised Christmas cards also allow for more interaction and greater flexibility. You can add hyperlinks to your website and track the resulting analytics, allowing you to accurately assess the effect they have on your business. Personalisation has a massive impact in any type of marketing, but can be particularly effective this time of year. However, printing out individually personalised cards, will set you back weeks in production, and not to mention, end in a bigger bill for the novelty. 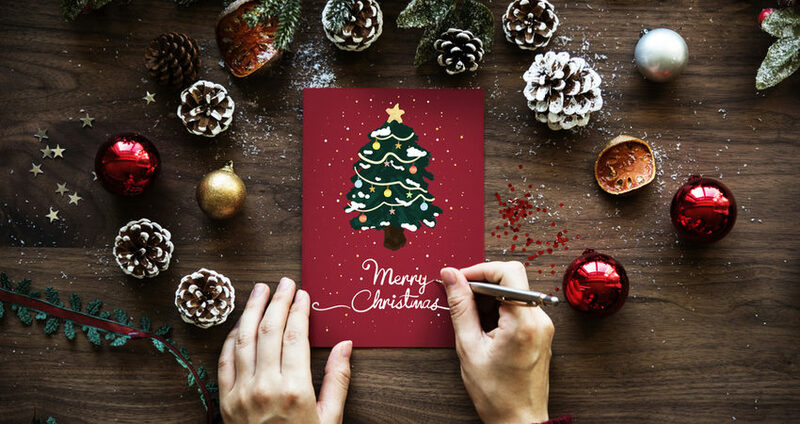 Digitised Christmas cards give you the flexibility to personalise each card with ease, this also means that you have a much wider audience reach. Since there’s no high shipping costs to worry about, you’re able to target your international customers too. Sleigh yes to better Christmas cards! With the year coming to an end, this is a prime opportunity to target new prospects in time for the new year as well as maintain and strengthen existing relationships with your customers. Whilst everyone has their own traditions, the time for conventional company Christmas cards alone may well be coming to an end. It’s now time to start thinking differently and show your customers exactly what your business is capable of and harness the best of what digital marketing has to offer. Increasingly, we’re finding that our customers want to harness the best of both online and offline marketing. For several customers this year we have mixed interesting digital ideas with custom-made Christmas cards, and used the card to direct people to engage in social campaigns run through the festive period. This enables you to show case your personality, demonstrate some social responsibility, perhaps through charitable endeavours, and prove you’re a fun company to do business with. Get in touch with us today to see how we can help you modernise your Christmas marketing.